To those who have read the articles here or listened to the podcast, you will not be surprised to learn that I am a huge Vlaada Chvatil fan. Even the games I don’t think quite hit the mark (like Dungeon Lords) are still utterly fascinating in their conception. There’s a particular kind of inelegance that permeates his designs which might be a problem for other designers, but with Vlaada it somehow works. I can’t quite pinpoint exactly why it works. In some cases (Galaxy Trucker, Dungeon Pets, and others) the game’s humor is used to not only excuse some of the more obtuse parts, but to create mnemonic aids to help remember them. But I think mostly there’s been a level of trust developed between Vlaada and his fans over the years. The game might be a bit obtuse, and you know it’s going to be difficult, but in the end it’s going to be a rewarding experience. 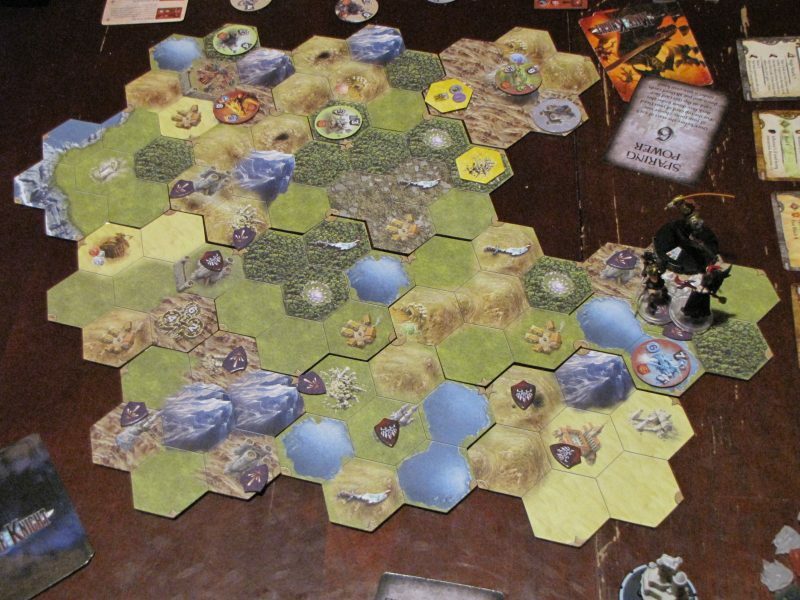 To me, none of his games is more rewarding than Mage Knight. This is his most obtuse, biggest, most complicated game (Through The Ages is second on this list), and once you wade through the rulebook and start to understand what’s going on, it’s a fantastic time. There’s some kind of mythos behind Mage Knight, involving something called the “Council of the Void”. I don’t remember much, but as one of the mage knights, you have super-awesome powers and you’re trying to destroy everything in your path for some reason. To do that, you need to utilize your deck of cards as efficiently as possible. 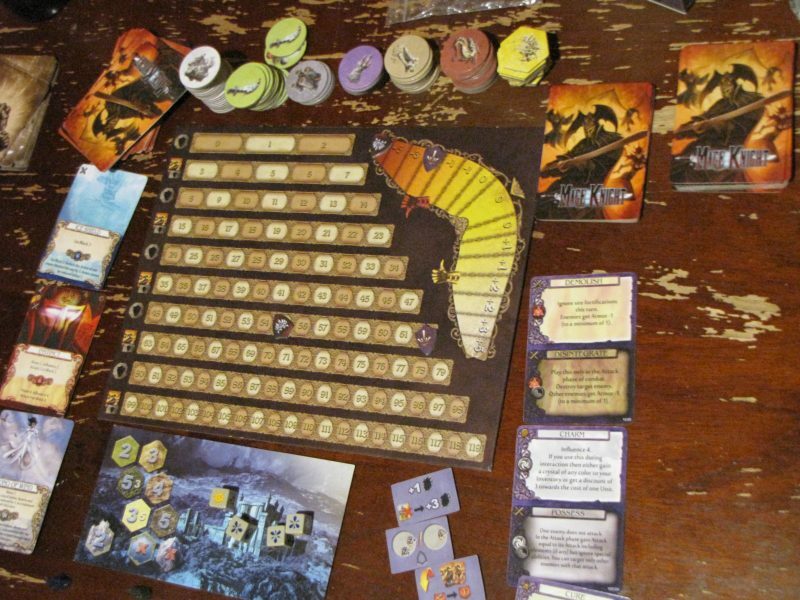 See, Mage Knight looks like a wild Ameritrash-y adventure, but underneath is a merciless mess of mechanisms that turn each turn into a difficult puzzle. Everyone starts with a deck of cards with some basic actions on them that allow you to move, attack, block, and gain influence in order to recruit heroes. Depending on which scenario you choose (more on that later), you may have different objectives or set-ups, but ultimately you’re probably going to explore a certain number of terrain tiles and then try to destroy a city. On your turn you’re just going to draw a hand of cards and then use them to progress towards your objective. How you progress is entirely up to you and the cards you draw. See, Mage Knight is a deckbuilder, but in slow motion. In a game like Dominion or Star Realms, you’re easily going to have over a dozen turns of buying cards, and you’re going to be re-shuffling your deck almost that many times. In the longest Mage Knight scenarios you will go through your deck exactly 6 times and no more. This gives it a completely unique feel among deckbuilders. Every time you acquire a new card it feels weighty and significant, for three reasons. First, you put newly acquired cards on the top of your draw pile, not in your discard pile. So often you will have to make a choice between getting a card that you know will help you out on your next turn, or one that will be more beneficial in the large battles at the end of the game. Second, you know exactly how many times you will be able to use that card for the rest of the game. Does it have a powerful but conditional ability, or a generally useful but weaker one? How many times do you expect to find a use for it the rest of the game? Third, every card is hard-earned. You win them by destroying mighty mage towers, scouring dangerous tombs, and beating enough monsters to level up. Each and every new card is a prize, and they’re powerful enough relative to the starting cards to always be an exciting acquisition. So you place your mini in the starting spot and you see a couple of orcs nearby and a village. You draw your hand of cards and see what options are available to you. Have some combat cards? Consider fighting one of the orcs to not only gain some XP but also a reputation gain because you’ve made the countryside more safe. Have some influence to spare? Maybe you can head over to the village and recruit a unit to help you through the rest of your adventure. Of course, all of that requires you to have movement cards, which is one of the more common complaints I see about Mage Knight. Yes, there is an element of luck in the game with the card draw, but it’s mitigated in a couple of important ways. First, at the beginning of each round, you choose between six cards that not only determine player order, but also provide some kind of bonus ability. Many of those cards will allow you to recover from a poor starting hand. Second, any card can be played sideways to gain one point of a basic action (move, attack, block, or influence), so you’re never completely stuck, even though you might have to take an inefficient turn. Anyone who thinks that Mage Knight has too much luck should look at an expert session report like this one and try to keep making that claim. There is some luck, but that person is thinking on a completely different strategic level than me, and it shows. That’s not to mean that you won’t ever be locked out of something you really wished you could do. Mage Knight is about using what the cards give you intelligently and strategically, not about settling on a course of action and forcing the cards into that path. The game provides an end-goal, and your general strategic plans will point towards that goal, but most of the game is very tactical. Every new hand of cards is a delicious new puzzle to figure out. This might be frustrating in a smaller game, but because Mage Knight has so much going on, I never get the impression that I’ve been railroaded into anything. It’s a beautiful bit of design. The card management puzzles are interesting enough to make you feel accomplished when you “solved” one, but the game is so sandbox-y that there are frequently multiple good solutions with any given hand of cards. Compare this to a co-op game like Pandemic. It has fantastic puzzles regarding board movement, card management, and understanding risk, but when you “solve” the puzzle of any given turn, you’ve figured out a single path (or maybe two identically risky paths). 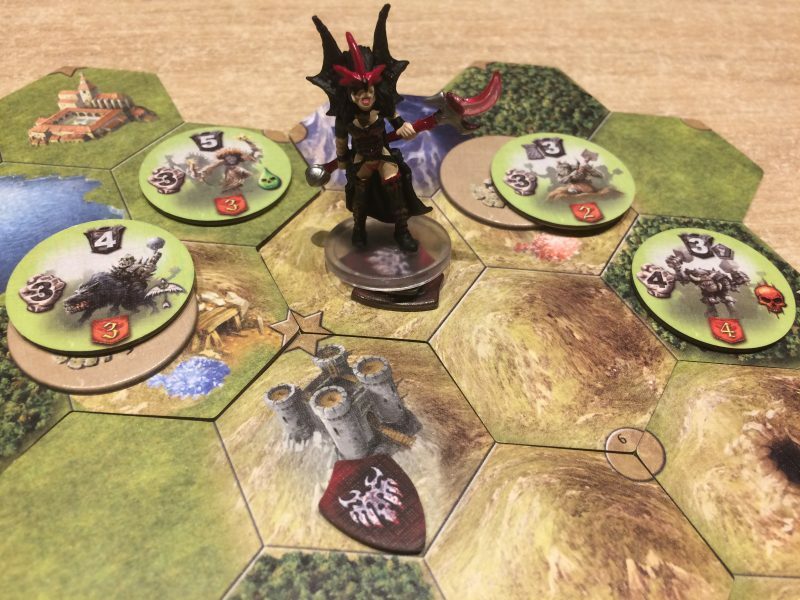 Mage Knight provides both a broader and a deeper experience so you still have decisions to make and risks to evaluate after you’ve figured out the initial puzzle. Risk assessment is more complicated simply because there are so many factors to consider, and some of them are unknown. While exploring the map you’ll find wandering orcs, keeps, towns, monasteries, mage towers, cities, crystal caves, and more. Most of those will have their specific combat stats facedown until you decide to attack or move adjacent to them. You don’t know what cards you will draw next, but you will have a general impression of what’s remaining in your deck. There’s a day/night cycle where some terrain types are more difficult to cross at different times (and spells can become superpowered at night). There’s also a really neat magic system. Each round (shifting into day or night) you will roll a few mana dice. Each turn you can use one of those dice to power up a card of that color. So while you may have a “move 2” ability in hand, if you use the correct mana color, you can turn that into a move 4. Certain cards may give you mana crystals, which are permanently stored with your character until you want to use them. Deciding what to use your mana die on can be agonizing, and deciding whether or not to spend a crystal even more so. I feel like I’m explaining without communicating here. The truth is, there’s so much to Mage Knight, so many bits and cards and and pieces and abilities to consider, that I have a hard time putting into words exactly why I love it so much. So let me provide you with a story from the last game I played. I was in a three-player cooperative game and we had been doing well, but I was furthest behind in experience and had the worst deck. I knew that I needed to start taking some risks and brave a few wounds (which are in the form of useless cards that clog your hand) if I wanted to be prepared for the final battles. So I dived into some spawning grounds and fought two mid-level monsters. I had a lot of attack in hand, and had gained a couple of great persistent skills from my level-ups, but I was afraid I was going to have to take a lot of wounds. I drew the monsters and none of them were devastating, but they were going to have some nasty bites. I looked over my hand of cards and started trying to figure out how to do this. I could defeat one of the monsters fairly easily, which was good, but the second one was going to be tricky. I tried a couple of different lines of attack in my head. I couldn’t figure out how to do this without taking wounds, but I had a sense, a,feeling, that it was in the cards somewhere. After a minute or two, I had it. In my excitement I jumped up and shouted, “Yes! I’m awesome!”, much to the surprise of my friends. This wasn’t the end of the game, it wasn’t even particularly difficult enemies. But it just felt good. And the key with Mage Knight is that the game is so challenging that every single time you accomplish something it feels great, from the first lame orc to the final terrifying dragon. The game is proof that rewards feel better when you work for them. Work is a good word, because even on the easiest difficulty levels Mage Knight is not a stroll in the park. If you’re looking for a dungeon-crawl skirmish-y dice-chucker, this is absolutely not the game for you. After a while the easy difficulty level will indeed be easy, but the complexity of the game will remain. And boy it is complex. The core mechanisms are simple, but this is the kind of game that can only be described as fiddly. Each of those enemy types I listed above each come with their own reference cards that explain what kind of creatures you’ll fight there, what rewards you’ll gain for winning, and what other conditions are applied to the encounter. Maybe you’ll be exploring a tomb and night rules will apply in the dark, or maybe you’ll be at a monastery where you can hire certain units (but only some–each unit can only be hired at certain building types), pay influence to heal wounds out of your hand, or even burn down the monastery at a -3 hit to your reputation where the reward is an artifact and you can’t use any of your units. Oh, and because it’s a structure all of the enemies there are going to be fortified. Or look at combat itself, which follows the “simple core with tons of additions” format. When you fight a creature there’s an initial ranged attack phase, then the monster attacks you, which you can block, and then you can attack the monster with normal attacks. It’s a clean structure but there are all sorts of factors to consider. Monsters can be fortified, which means that ranged attacks cannot work on them in the ranged attack phase, but siege attacks can. They can have elemental attacks, like ice or fire, which are blocked inefficiently (½ effect) by normal blocking powers, but can be blocked efficiently by the opposing element-type block. They can similarly be resistant to certain types of attacks. Maybe they’re brutal, which means they apply double the number of wounds, or maybe they’re swift, which means that they require double the amount of block power to oppose them. And that’s not even half of it. Fortunately there are a number of reference cards that will be of tremendous help in trying to remember all of these things. Unfortunately, the rulebook itself is awful. The game comes with both a tutorial/walkthrough guide, which is decent, but the rulebook proper has such tiny font and so little organization that it’s daunting just to look at it. One of the first things I’m going to do when I get video recording capabilities is to try to record a relatively brief rules tutorial for this game because I want to spare people from the tortures of that rulebook. Honestly the rulebook might be a deal-breaker if the game wasn’t so amazing in the end. I haven’t found most of the information difficult to remember, so once you get past the initial learning curve it becomes significantly easier to play. It also becomes easier to teach. Because the core of the game follows fairly straightforward mechanisms, you can get away with teaching the basic concepts and only explaining the fiddly bits once your companions need to know them. The other big problem with the game is time. There’s a lot to set up so you’re looking at 15 minutes or so at the beginning of the game, at a minimum. The game itself can stretch a long time. I haven’t found the short scenarios to be particularly compelling, so I’ll only play with a full 3-day, 6-round scenario. With two players who know what they’re doing it takes about 3 hours to complete. I just played a three player game, however, with one person who was essentially new to the game, and it took more like 6 or 7 hours (we had to split it up over multiple days). I’d never in my life consider playing a 4 player game of Mage Knight. Two players is perfect for me, but the game is fantastic solo as well. The main difference between solo and multiplayer is just one of scale (additional or fewer map tiles and boss difficulty). While there are competitive scenarios, I have never felt a desire to play them, or to even learn the PvP rules. First, because the cooperative and solo game is so fantastic, and I love sharing my success with a teammate. Second, because the game has such a tight sense of progress and momentum that I’m afraid a PvP skirmish might hurt one of the players so much as to effectively take them out of the game. I could be wrong, though. If you enjoy the competitive mode, let me know why in the comments, and maybe I’ll be convinced to give it a try. 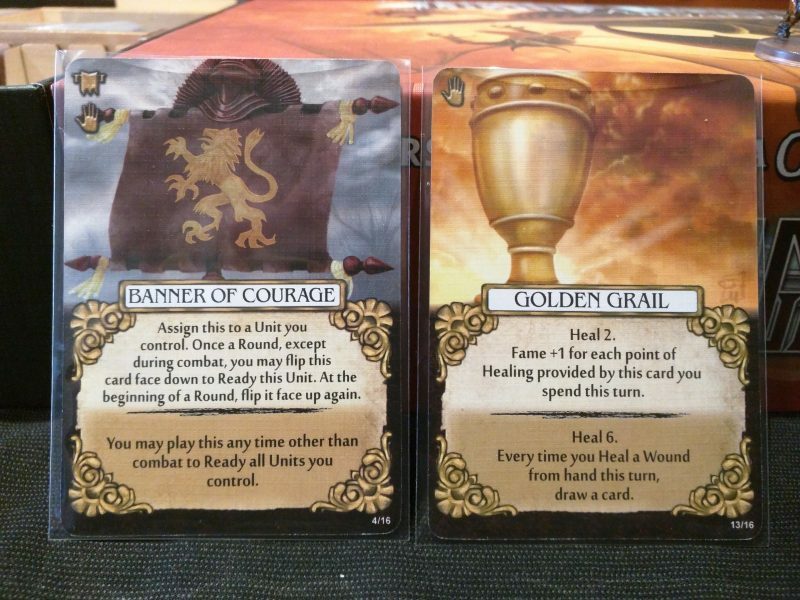 There are three expansions right now for Mage Knight, and I’ve played two of them. The Krang character pack is what you would expect: a new character and the cards and tokens needed to play him. He’s a fun character with some cool abilities, too! I haven’t played the Shades of Tezla expansion due to some printing incongruities I’d been warned about, although a quick look at the BGG forums indicates that it may not be an issue anymore. But the Lost Legion expansion is absolutely fantastic. It’s the most expensive expansion but it also has the most content. First it gives you a new character, Wolfhawk, who might be my favorite out of the entire group. She’s just really fun to play, and very deadly. Second, it provides additional character-specific basic action cards. Where the base game had only one card to distinguish the characters, now you have two. It makes a world of difference. Third, the expansion gives you more advanced actions, spells, and artifacts–good stuff. Most importantly, however, you get Volkare, your new nemesis, and scenarios to go with him. The best, Volkare’s Return, has him starting near you on the map. 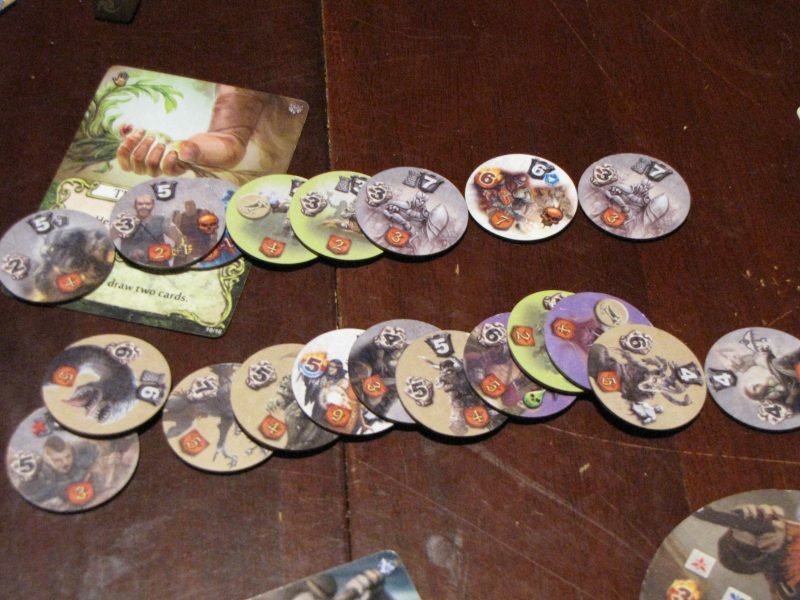 He takes random actions based on card draws on his turn, and you need to race to conquer a city before he can arrive. Once the city is conquered, he’ll continue towards it, and you’ll need to defeat him when he arrives. It’s too difficult to explain the details in any comprehensible way for those who haven’t played the game, but trust me that this is both a more interesting and robust AI system compared to the cooperative scenarios in the base game, and a more fascinating narrative arc for the adventure. You need to stay clear of Volkare as you explore the lands, lest he attack you prematurely, and the double boss fights near the end are fantastic. If you’ve played strategically, you’ll be able to conquer the city, level up once or twice from that encounter, then heal and plunder the goods of the city to become even more strong before the final, more difficult encounter. It provides an epic narrative conclusion to an already epic game. I’ve recommended amazing expansions before, but this is the first one I’d say is almost mandatory. There’s so much here that improves and rounds out the game, that I can’t imagine playing without it. This is the most difficult review I have ever written, mostly because I’m having a difficult time explaining exactly why I find this game so compelling. I could say that it’s brilliant because it manages to combine very crunch puzzles on every turn with all of the Ameritrash epicness you could want. I could say that every encounter is difficult and satisfying, and that towards the end of the game you look at all of the enemies you’re able to dispatch with amazement, because just a couple of hours before a lone orc seemed tough. I could say that the game becomes even more rich and rewarding as you play, because you have a better understanding of the decks, and you can adjust the difficulty levels to always give yourself a challenge. I mean, I don’t think I’m bad at the game, but I’m only 1-6 at the medium difficult levels. I could say that solving tough hand-of-card puzzles makes you feel awesome. But I’ll end with this. 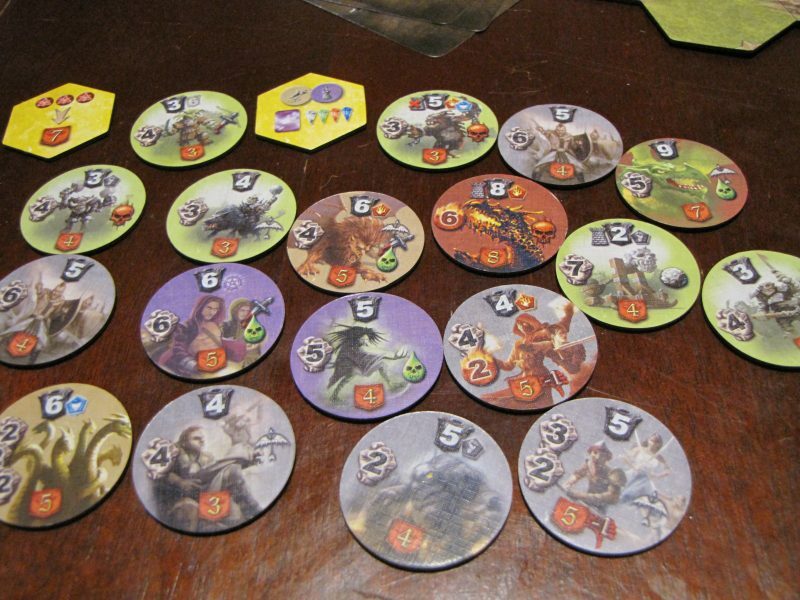 When I sit down to a game of Mage Knight, I enjoy setting up the game–shuffling all of the cards, separating the tokens. I enjoy choosing a character and wondering what kind of build they’re going to have by the end of the game. I love looking at the starting board and wondering what surprises I’ll discover as I wander into more dangerous lands. Throughout the game time seems to go away–I don’t notice its passage and instead think of terms of days and nights. And I subject myself to the cards. I know that I’ll need tactical shrewdness to conquer the challenges ahead, but I also know that I can’t fight the cards. I have to look at what they give me, take a deep breath, and shape that into a win. There’s a bit of zen here. You think this is a 5/5 for complexity and learning curves? Dude, you haven’t witnessed the godfather of (fantasy) board gaming if you think that. Try taking a look into Magic Realm from 1979. Much more sandbox-like compared to this, but also more complex. Just to give you an idea, the 3rd edition rulebook is over 120 pages in length. 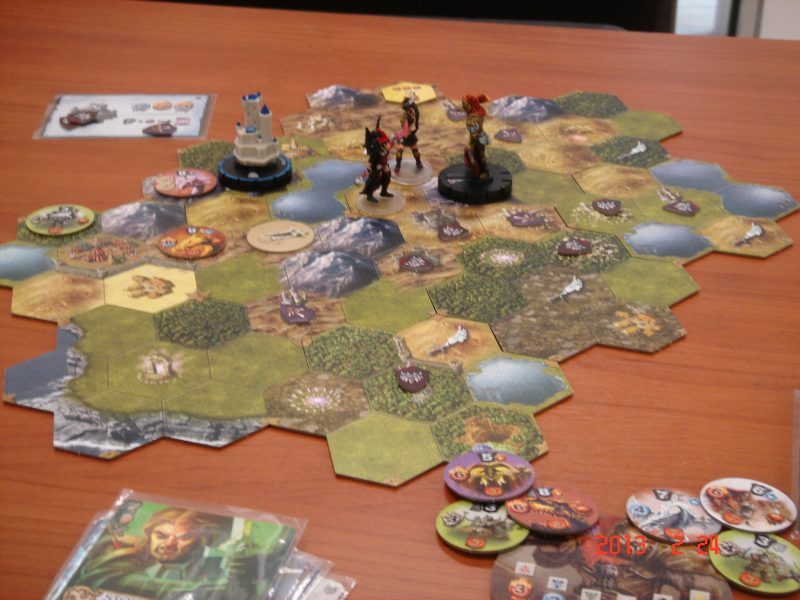 Mage Knight would probably be my favorite solo-playable fantasy game if not for that one. It’s a 5/5 on my scale (“commitment required”), though I definitely understand it’s not nearly as complicated as many games. Consider this on the low end of a 5/5 rating. And I’ve definitely looked into Magic Realms before. I’d love to get my hands on a copy someday.